I cook up handy MaxScripts to make the lives of video game developers easier. Feel free to contact me with feedback and/or requests. By downloading a script you agree to the license at the bottom of the page. Copy MCR files to the UI/MacroScripts folder. Copy MS files to the Scripts folder. Copy BMP files to the Scripts folder. Copy GUP files to the Plugins folder. Look in the monsterBlues category to bind to a hotkey. Note: If a file type doesn't exist, skip the step. 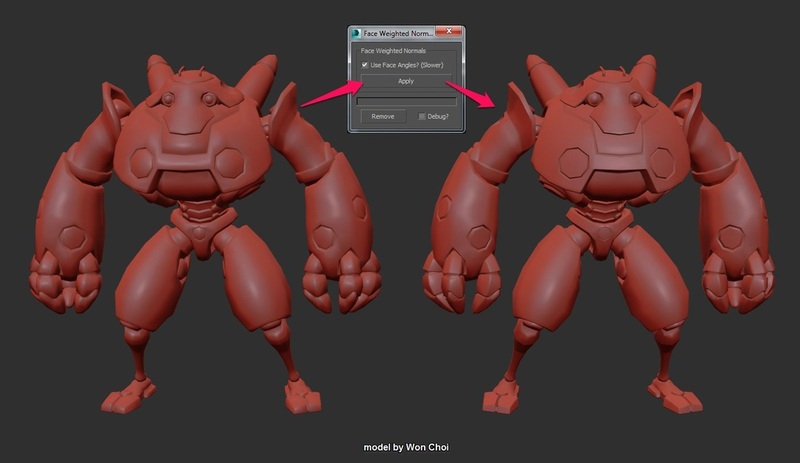 Face Weighted Normals or FWN will add an Edit Normal modifier and bend all the normals toward faces with larger area. This gives the model a smoother look and normal maps will have less gradients when generated. It's becoming popular to overlay a gradient to give emphasis to more important areas of a character. (See DOTA2 style guide.) This script will take your object selection and apply a gradient in object space for each object and render it out to a texture. I don't like to use Orthographic views when animating. If you rotate the Top or Front view, this script will automatically convert the Orthographic view to Perspective. Put it in the script Startup folder. This tool lets you attach and detach objects that are skinned. The skin weighted is preserved when combining and detaching. 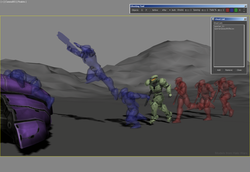 I liked using Discreet Move in Maya. In 3ds Max Grid Snapping only works on the ground plane. With Grid Move objects will snap to the closest point on the grid. Have you ever started skinning an object to the wrong bone? Or have you ever needed to reduce your bone count? Replace Weights will give all the weighting from one bone to another. Simple script that will expand your selection to adjacent faces with the same material ID. This is an assortment of tools for the curve editor. Drag and Drop the MZP file into the viewport to install. Update: KeyTools is now officially part of 3ds Max 2017! You no longer need to download if you have that version. This tool lists BIP animation in the selected folder. It's perfect if you have hundreds of BIP from a mocap shoot. When enabled this tool displays the frame number, time, and perfect through an animation relative to the start frame. This tool will help create mirrored morph targets. First initialize the model to find matching vertices, then edit one side of the model. This tool will select all non quad polygons in the selected edit poly object. In newer versions of Max use the Ribbon > Selection panel. 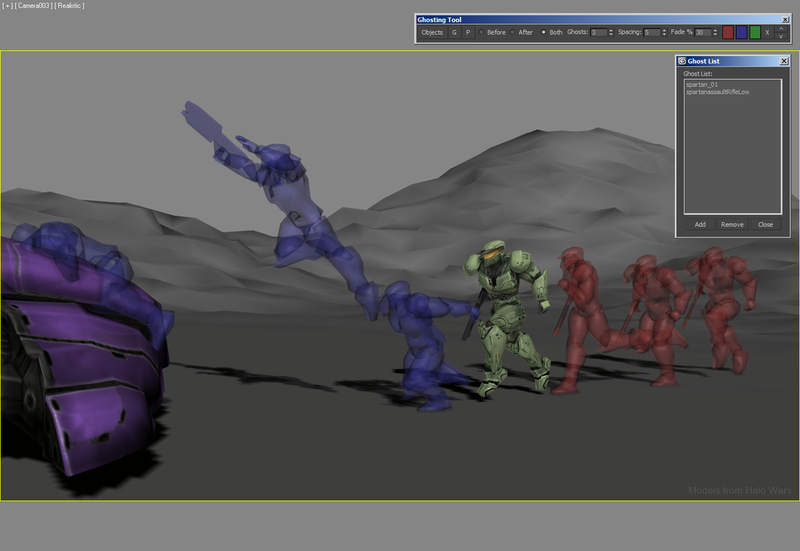 This is a group of simple tools used with the skin modifier. This tool allows you to adjust the object creation order. Handy if you are having alpha sorting issues. This tool simply centers the pivot for selected objects and moves them to the origin. This tools cycles Nurms iterations from 1 to 2 to off. This tool will increase Turbosmooth iterations by 1 on the selected objects (Upper limit is 5 iterations). Holding the Shift key will decrease. This tool will adjust biped key TCB properties with presets. This tool will report how much of a texture sheet you are using in percent. 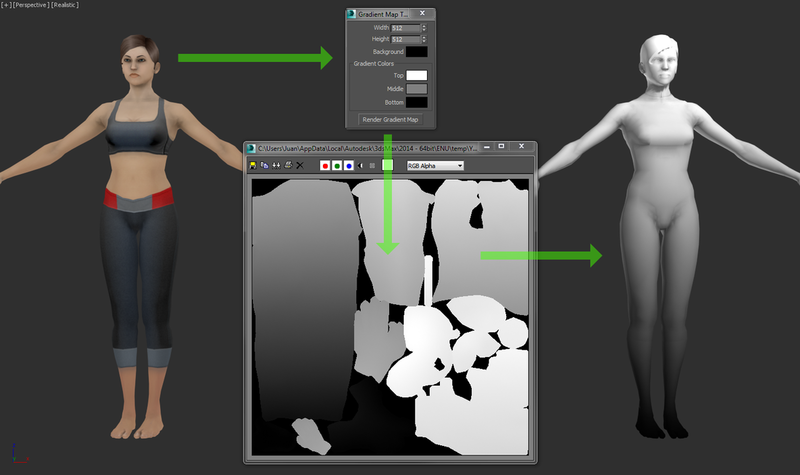 For example a mirrored character UV's should use close to 200% of a texture. This tool allows you to convert Physique Modifiers to Skin Modifiers and back. For Max 9 and older. This tool will help you mirror Physique skinning. For Max 9 and older. This tool displays the correct number of triangles for selected objects. For Max 9 and older. This tool removes edge loops or rings. For Max 6 and older.